We had to wait 20 years for this studio cast recording. It was about time! Let me explain. This Gershwin musical had two versions, one in 1927 and one in 1930, and in 1991 a studio cast was made of both versions but, for reasons unknown to me, the 1930 version was put on hold and only now, thanks to PC Classics (Tommy Krasker was part of the 1991 group), we’re able to listen to it. I guess that if, like me, you have the 1927 version you may think you don’t need the 1930 one. After all, the double CD of that recording had (as a kind of bonus) a few tracks from this one. But if you like classic musicals as much as I do, you shouldn’t miss it. The 1930 version changed the main subject of the musical from cheese to chocolate and things became lighter and, for my delight, it seems more dance was introduced. As for the Gershwin’s score it didn’t lose any of its qualities and there’s plenty to enjoy here, in fact there isn’t a dull track here. From the star cast to the chorus, everyone involved gives their best and the result is a great album, with great orchestrations and the delicious sound of Broadway’s golden age. I can’t resist numbers like “I Mean to Say”, “I’ve Got a Crush on You” and “Hangin’ Around with You”, here sung by the charming duo of Jason Graae and Juliet Lambert. It’s a pity that Rebecca Luker and Brent Barrett only share a song, the melodious “Soon” (in the 1927 version they had more duets, among those one of my favorites – “Meadow Serenade”), but Barrett strongly delivers the title song. Another couple that enjoys a funny moment, “If I Become the President”, is Beth Fowler and Charles Goff. I also love “Mademoiselle in New Rochelle”, “How About a Boy?” and “Ring-a-Ding-a-Ding-Dong Dell”. They sure don’t write songs like this anymore. 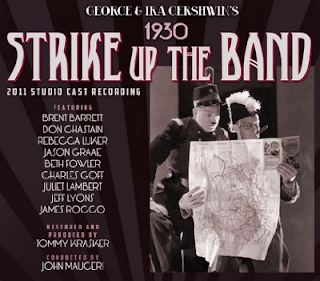 This is a great way to introduce STRIKE UP THE BAND to new generations and this is the kind of CD that should be in every Musical fan’s library. I have to end this review with a big thanks to PS Classics; you did it again!